This is my absolute favorite kind of story. Historical fiction, a bit of mystery, and a sprinkling of romance all rolled into one. Bonus points to this one for being set in a bookstore. When Valerie returns to Paris to take on a job at a bookstore, she has one goal in mind – find out the truth about what happened to her parents. You see, her grandfather Vincent owns the bookstore. Of course he has no idea he’s hiring his granddaughter. He does, however, take an immediate liking to Valerie despite his gruff demeanor. Slowly but surely, she begins to put together the pieces of a puzzle. This puzzle will tell the story of her childhood and why she was sent away at such a young age. But it’s a painful story to tell with more secrets than she’s expecting to learn. Such a great, great story. I adore historical fiction set in this era. And this one has such a heartbreaking family component to it that I just couldn’t put it down. A definite winner! 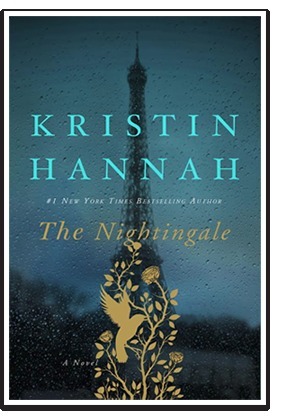 So are you a fan of Kristin Hannah? Read this book! Wait! You’re not a fan of Kristin Hannah? Oh well, read this book!!!! This is a book worth reading. From start to finish it had me completely captivated. A few weeks ago I was talking to a customer about the War. I now live in England and of course the War still has a presence here. Sometimes you run into people who remember what it was like. Having to take in strangers that were forced from their homes…and their lives….This customer was one such lady…It was just a random conversation that comes up unexpectedly…but leaves you pondering the entirety of the conversation…voicing my thoughts about what people had to go through…well, it has left me to wonder about life for long hours after the conversation ended. See here’s the thing I pointed out to her….it’s not Hitler I wonder about….it’s the every day people….we are so quick to judge….so quick to say, “I would NEVER do that.”…however…..how can you ever know? If your child is near death and hasn’t a drop of milk and you only have to nod your head when a neighbor’s name is mentioned…what would you do? If you only had to pretend to not hear the knock at your door of a person in need of hiding to protect your family….would you turn a deaf ear? If you were starving and there were five bites of sawdust bread for your entire family, would you be tempted to eat two bits of the bread? How easy would it be to walk away and close your eyes to Jews being marched down the street to their deaths? How hard would it be to take a step forward and show your support knowing you might be forced to join them? Here is that story that attempts to give you some insight to these hard questions. Here you have two sisters and a father…a father that has already come home from one war and now finds himself watching another….two sisters that each have different views of how to get through this war…Even though all three might have different ways of “living” during this time….who is to say which is the right way? As they perhaps judge one another for the choices they are making it is soon apparent to them all that there is no black and white in such circumstances.